With a plentiful amount of land in West Texas and in a prime location for solar, Fort Bliss (America's largest Army base) is on its way to achieving net zero energy consumption, thanks to a recently installed 1.36 MW solar power system. America's largest army base, Fort Bliss in West Texas, has gotten its marching orders from President Barack Obama to show the way toward greater energy efficiency. That includes looking at alternative, renewable forms of power generation to offset conventional energy sources—investing in solar energy is part of the mix. Given the plentiful amount of government land surrounding the base and its prime location for solar radiation, solar industry experts are confident that the base could achieve 'net zero' energy consumption. The term 'net zero' means that the base will produce enough power from its own renewable resources and save enough by implementing energy efficiency programs to reduce power consumption so that the power it consumes from the power grid is offset by power produced and saved on the base. Both Fort Bliss in Texas and Fort Carson in Colorado have been selected by the Army to achieve net zero performance by 2020 in base energy, water use, and trash sent to landfill. B.J. Tomlinson, renewable energy and sustainability program manager at Fort Bliss, says the goal is for the base to achieve net zero energy by 2015 and water and waste by 2018, adding that the base's ability to operate off-grid is also a security issue and in the national interest in terms of protecting the United States. He estimates that once installed, renewable energy projects on the base could produce over 140 megawatts (MW) of power. In terms of energy consumption, Fort Bliss is well on its way to meeting the President's challenge. The base recently commissioned a solar power project featuring 5,500 photovoltaic (PV) panels that will provide it with 1.36 MW of power. The power generated is moved through the power grid and is provided for general use at the base. It's expected that most of the power moved through the grid will be used to offset consumption at the base's headquarters building because of its close proximity to the solar installation and considering how much power it consumes. The project was implemented as part of President Obama's directive to achieve $2 billion worth of energy efficiency upgrades over two years using the Energy Savings Performance Contracting (ESPC) approach. In essence, this is an approach where a facility signs a contract to purchase power at a specified rate over a specified time period, without actually having to own or maintain the infrastructure. That is the case with this $16 million, 1.36 MW solar power project at Fort Bliss that was awarded to Johnson Controls. The Fort Bliss project was implemented as part of President Barack Obama's directive to achieve $2 billion worth of energy efficiency upgrades over two years using the Energy Savings Performance Contracting approach. In essence, this is an approach where a facility signs a contract to purchase power at a specified rate over a specified time period, without actually having to own or maintain the infrastructure..
By taking this approach, the federal government expects to save about $39 million in energy costs over 24 years. This is also the first Army project that was able to take advantage of a federal renewable energy tax credit, totaling $1.87 million. In addition to financial benefits to the federal government, the project also delivers environmental benefits by eliminating potential greenhouse gas emissions equivalent to taking 1280 cars off the road or planting 1400 acres of pine forest each year. The base, which covers about 1.2 million acres in West Texas near El Paso, is ideally suited for solar power given the region's arid, sunny environment. It is home to about 30,000 residents. The solar panel, fixed tilt racking array used in this installation was provided by HatiCon Solar and is made of light, non-corrosive, durable, and fully recyclable aluminum fixed at 10 degrees. HatiCon Solar says this shallow embedment ground mount system makes use of aluminum's non-corrosive qualities to decrease overall maintenance and replacement costs throughout the lifespan of the installation. The panels were provided by SolarWorld, and Satcon provided the grid synchronous inverters. 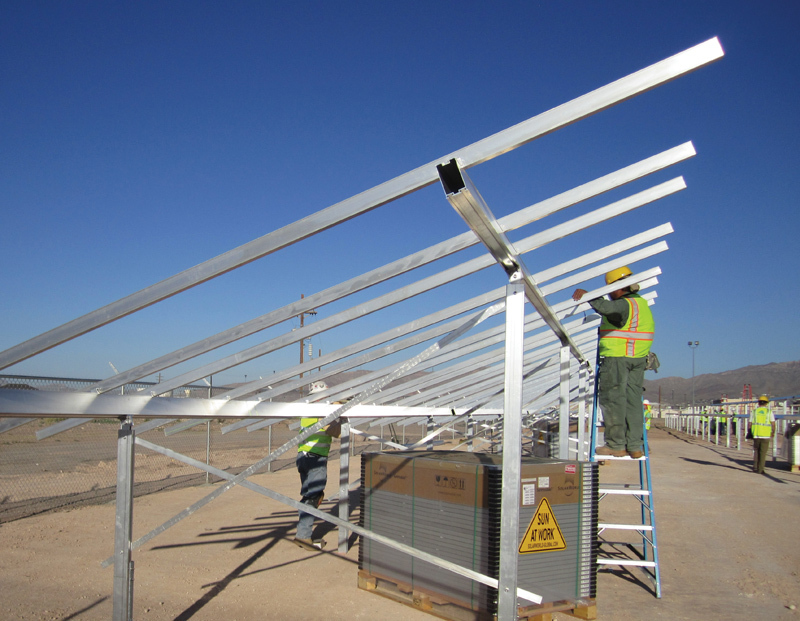 Handling the installation was SunQuest Energy, which has past experience working on energy efficiency projects at the Fort Bliss base. A few years ago, SunQuest Energy installed a solar pool heating system at the base, working with a company called Heliocol, the world's largest solar pool heating manufacturer and creator of its patented Individual Tube Design concept. Once again, SunQuest was able to tap into the abundant solar radiation in the American Southwest. Using the existing pool pump, the pool water is directed through a series of valves to the solar collectors. The pool water enters the solar collectors at the bottom and rises to the top through individual collector tubes. As the water rises through the collector, it is heated by the sun's radiant energy. The water then flows back to the pool and the cycle is repeated until the water is heated to the desired temperature. According to SunQuest, this method offers an immediate energy savings to the pool operator, and the system typically pays for itself in three to five years. "If there is a base that is perfectly suited for solar, it's a base that's in a high radiation zone," says Hudson Harr, director of development at SunQuest Energy. "Basically what you have is a desert region. 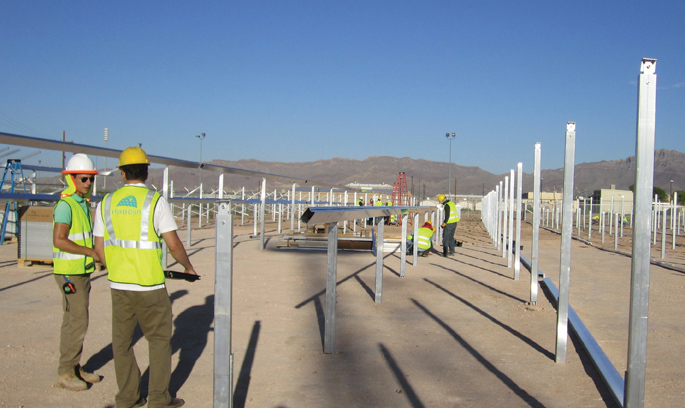 The fixed tilt racking system used in the Fort Bliss installation was provided by HatiConSolar and is made of light, non-corrosive, durable, and fully recyclable aluminum and is fixed at 10 degrees. The landscape looks almost like the Mojave Desert in some places." What also makes the area a prime location for solar installations is the availability of government land surrounding the Fort Bliss and El Paso vicinities, meaning that there is no need for solar power developers or the government to procure private land to provide the real estate needed for a solar array. The upside, Harr says, is that it allows companies to build solar projects "with very, very good economics" where the return on investment happens a lot faster than in places with a smaller solar resource and where developers need to use expensive real estate to install the solar hardware. "When you have these systems running darn near optimal, you really can go net zero, and it really becomes a question of storage capacity and time shifting the power to basically pair your production profile with your demand profile," Harr says. "There are a lot of factors lining up to help Fort Bliss achieve that net zero objective." Harr says that achieving net zero is not an easy path because it means that the Fort Bliss base will have to produce enough energy to the point where, on balance, they are not reliant on hydrocarbon power. It means that the base will have to produce enough power in the middle of the day to offset its power consumption for the rest of the day. "It's a challenging equation to achieve," says Harr, "because it means that you need to build essentially the same capacity as your average annual load." For a homeowner to achieve net zero energy consumption using solar power, he says, it may require three or four actual rooftop solar arrays. "But when you are in an environment like El Paso, you can do it. It is absolutely a viable concept." There are areas of the Southwest and Southeast where the economics of solar power generation are "really close" to grid parity, Harr adds, which he defines as the rate that the existing conventional utility can produce electricity for. "We are seeing power purchase agreements (PPAs) that are approaching avoided cost for the utility, and that's a really exciting thing because now some of the larger companies in our industry can basically operate like utilities," says Harr. Avoided cost means that in certain markets, solar can compete head to head with conventional forms of power generation. "If you can compete head to head with those generation sources, that's going to grow the business," says Harr. What's helping to drive the cost of solar generation down is the current extremely tight profit margins being experienced by solar industry suppliers, which has pushed the industry into a consolidation mode, as well as an ultra-competitive environment, at a time when there is also significant capacity expansion taking place. "With this rush to build capacity in an ultra-competitive environment, as often happens, everyone becomes more efficient," says Harr. "The install price comes down, the module price comes down. I've seen the cost of solar modules come down 60 to 70 percent, and they are still down despite a lot of tariffs imposed upon internationally procured modules." 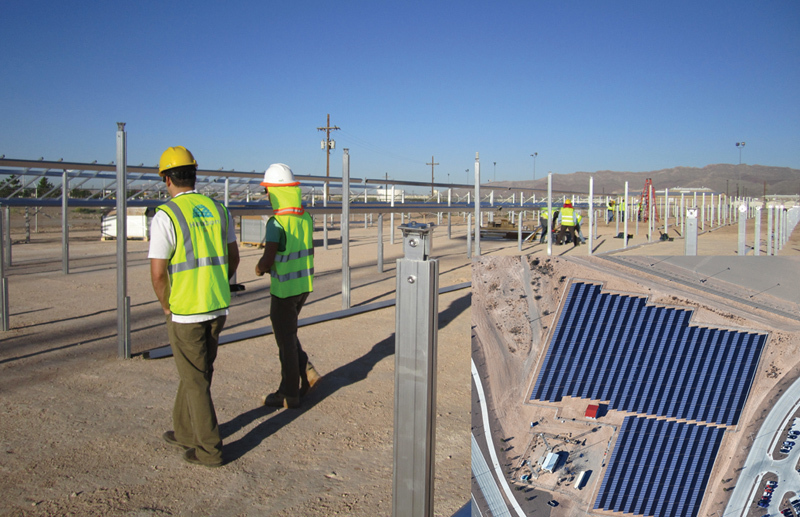 Given this trend toward achieving greater efficiency among industry suppliers, an ultra-competitive environment, and combining that with projects in areas with high solar radiation per square foot—as is the case in and around Fort Bliss and El Paso—the business case for solar power production starts to make a lot of sense. Harr says there is no doubt that continuing energy efficiency programs from the federal government that include a renewable energy component, like the one at Fort Bliss, are playing a major role in the continued proliferation of solar energy. Private industry can only contribute so much because they tend to demand payback within very defined timelines. Government can play the role of advancing large, capital intensive investments that have a very long, but important life cycle. "I think that renewable energy fits into that box, and I am not really talking about the environment, but what I am really talking about is the fact that we are going to run out of hydrocarbons, maybe not in 30 years, but in 50 to 60 years," says Harr.